Meaning: I was a hidden treasure, I intended to be recognized and hence, I created the creation. Almighty Allah created humans for His recognition and gnosis (marifa معرفۃ ) but unfortunately they have forgotten this very purpose of their creation. The aim of life is not a hard one to accomplish nor does the way to Divine vision (Deedar-e-Elahi دیدار الٰہی) goes through ‘unbreakable’ veils or an odyssey. There is ‘a veil’ between man and Divine vision but its reality is thinner than that of an onion skin. 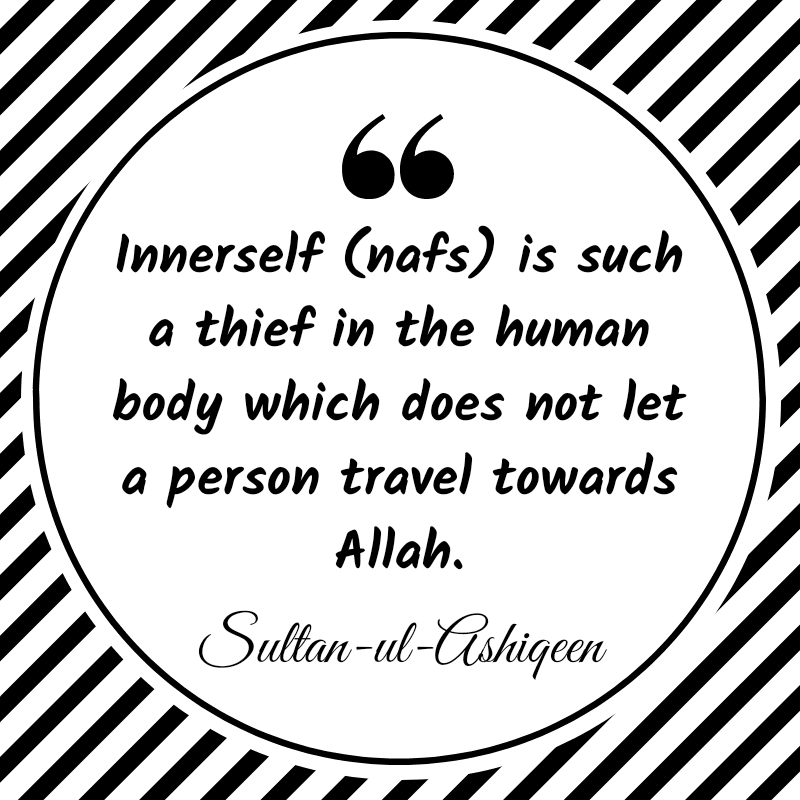 It is innerself (nafs نفس). If one is not cured of this sickness then let it be assure that Divine vision is an impossibility not only in this world but the hereafter as well. Satan was banished and became the lowest being because of the raging innerself in his inward. It made him arrogant. Now he uses it to mislead mankind. To sum up, innerself has diverted all the focus towards itself then how is it possible to ponder the slightest over the esoteric self. Man is in a web of deceit. There are four stages of innerself. When a seeker is at the station of sharia in this world, his innerself incites him, so Allah orders him to kill this enemy. O Allah! Bless me with the eyes which can see and recognize the enemy so that I may kill it. When the seeker progresses spiritually and reaches the station of mysticism in the realm of angels, his innerself becomes repenting. On reaching here, one must leave the pleasures of innerself, crush all its appetites and become independent of all its desires. Then his level elevates to the station of Reality in realm of power where his innerself becomes inspiring. One must burn it in the fire of Allah’s love and His invocation so that it approaches the level of ‘death before dying’. What people have inciting innerself? This particular innerself belongs to disbelievers, polytheists, hypocrites, transgressors, debauchees and desirous of the world. Moreover, if it is not corrected or rectified properly, then with its rebelliousness and disobedience its evil keeps on growing and from human it turns to animal and from animal to beast, rather to Satan. Undoubtedly, Allah is benevolent and the most Compassionate who through the mediation of his pious and elevated men purifies inciting innerself of sinners. It means that when the perfect spiritual guide corrects the rebellious inciting innerself then it ascends to the realm of angels (alam al-malakut) where it purifies to repenting innerself (an-nafs al-lawwamah). What is innerself at peace? What the Arabic letter of innerself at peace depicts? The innerself which has elevated to peaceful also has three Arabic letters: ن (NA), ف (F), س (S). ن (NA) means that it laments day and night with the fear of Allah, leaves the forbidden and follows the commands of Allah, eats legitimate food, keeps the faith perfect by true obedience. The Divine favour helps it and is engrossed in the Divine deeds like invocation, reflection, gnosis, meditation and Divine observations. When the innerself reaches the Divine light, it becomes the innerself at peace and its possessor is completely forgiven. Verily, Allah is the most Forgiving and the most Compassionate. The possessor of peaceful innerself is at the final level of certainty gained through experience. One is at the level of immersion in truth and never looks towards falsehood. Faqr and gnosis of Allah are the foundation of Islam while worldly wealth is the foundation of infidelity. The foundation of heresy is love of the world while foundation of right guidance is the love of Allah. If one studies the enlightening biographies of Companion and Saints, keenly then it will become quite obvious that they were constantly engrossed in the purification of their innerselves in earthen bodies to travel to the realm of Divinity (alam al-LaHoot). It is a form to worship to account innerself unless it purifies completely and reaches its highest degree of innerself at peace. One gains this state by endeavours and without its purification one cannot become unified with Allah. It is the negation of innerself which relieves oneself from mortal world. Sultan Bahoo laments on the condition prevalent among Muslims that they find the Lord who resides within them in the world outside. Therefore, he advises to find Him within by first purifying the blackness of innerself from the inward. In his teachings, he calls the invocation (dhikr ذکر ) and contemplation (tasawur تصور ) of Ism-e-Allah Zaat ( اَللّٰہُ ) the cure of innerself. First the seeker of gnosis of Allah has to purify his inward which is impossible without the invocation and contemplation of Ism-e-Allah Zaat acquired from the perfect and accomplished spiritual guide of the Sarwari Qadri order who is the absolute light of guidance. Nafs ki haqeeqat aur ilaj Sultan-ul-Arifeen ki taleemat ki roshni mein ( نفس کی حقیقت و علاج سلطان العارفین کی تعلیمات کی روشنی میں ).